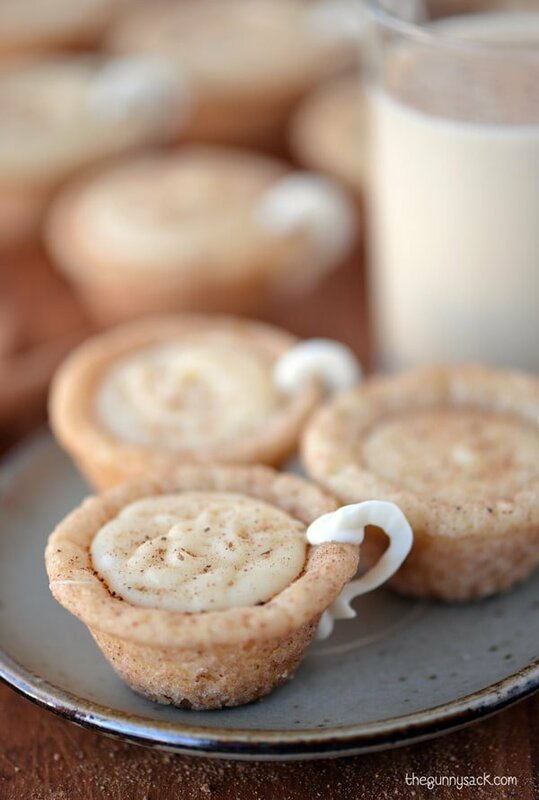 Eggnog Cookie Cups are sugar cookie cups filled with eggnog ganache. This edible craft idea is an easy eggnog recipe that is perfect for Christmas. Welcome back from Thanksgiving weekend! I hope you all had a wonderful time. We spent Thanksgiving with Brian’s family and it was such a nice day. We stuffed ourselves with delicious food and had fun visiting with everyone. On Black Friday, we stayed home all day and didn’t buy a single thing…very “unAmerican” but wow was it ever relaxing! Last year, we had so much fun making and EATING our Hot Chocolate Cookie Cups that we decided to try an eggnog version this year. The guys in the family are huge eggnog fans, while the girls are definitely in the chocolate camp. Brian and Zack love it when they can order eggnog shakes around the holidays. Zack quickly drinks the eggnog every time I’ve put a carton in the fridge and he said that they eggnog cookie cups are the best cookies ever! 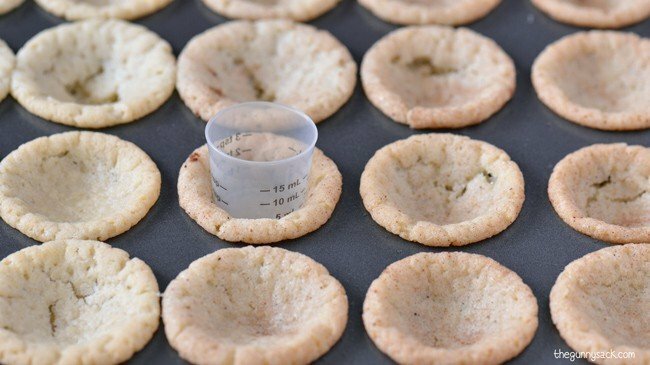 I’ve gotten a lot of questions in the past year about how to make the cookie cups. Lots of you have had issues with the cups sticking in the pan and/or crumbling. So this year, I made a short video showing how I go about making them. It’s at the top of the post. I hope it helps. And I also included step-by-step photos of the process. 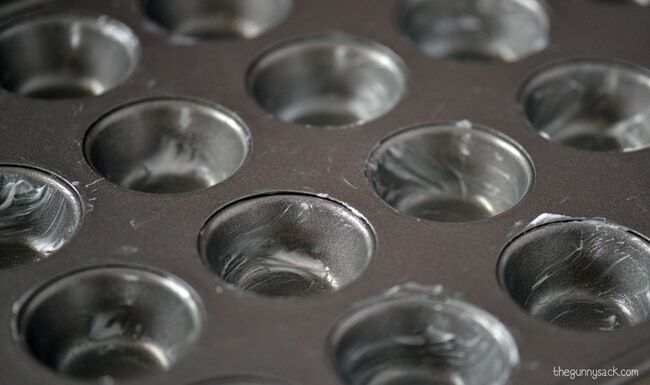 Start by greasing the mini muffin pan cups very well with shortening. Scoop one tablespoon of the dough, roll it into a ball and coat it with a mixture of sugar, cinnamon and nutmeg. Not only will this make the sugar cookies more delicious, it will make them come out of the pan easier. Place the balls in the pan and use a small spoon (or your thumb) to make an indentation. Bake the cookies at 375 degrees for 12-14 minutes. 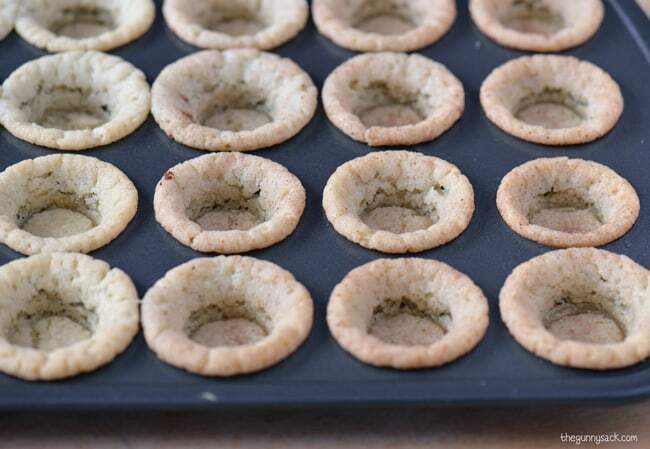 Remove them from the oven and use a small cup to make an indentation in each cookie cup. Or just leave them as they are and then you will only add a shallow amount of eggnog ganache to each cup. As you can see, mine aren’t perfect. 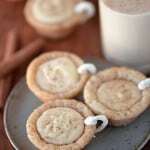 You can use a finger to gently press the soft cookie on the sides of the cups to sort of “fill in” those areas. Allow the cookie cups to cool completely in the pan. Gently remove the cups. If you are having a hard time, use a knife to gently lift the edges. Bring the eggnog to a boil and pour it over the white chocolate chips. Allow it to sit for 3 minutes and then stir until the ganache is smooth and creamy. 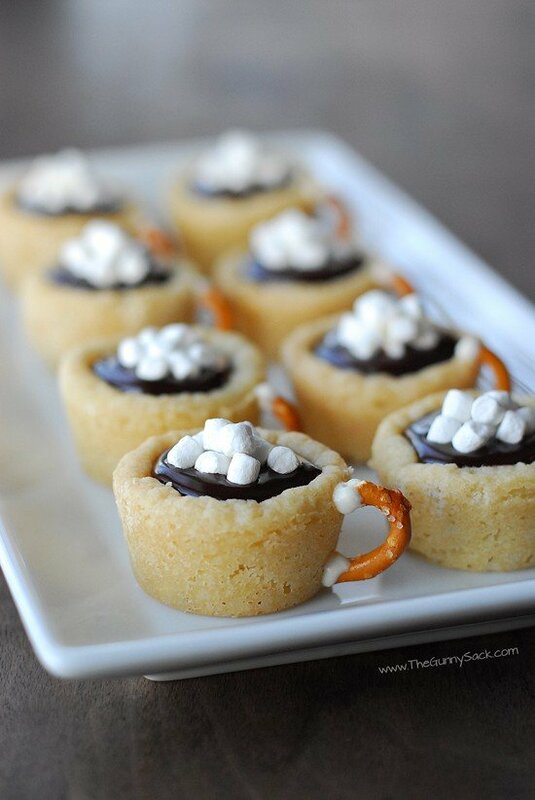 Fill the cookie cups with the eggnog ganache. Use melted almond bark to pipe small, backward “c” shapes on parchment paper. 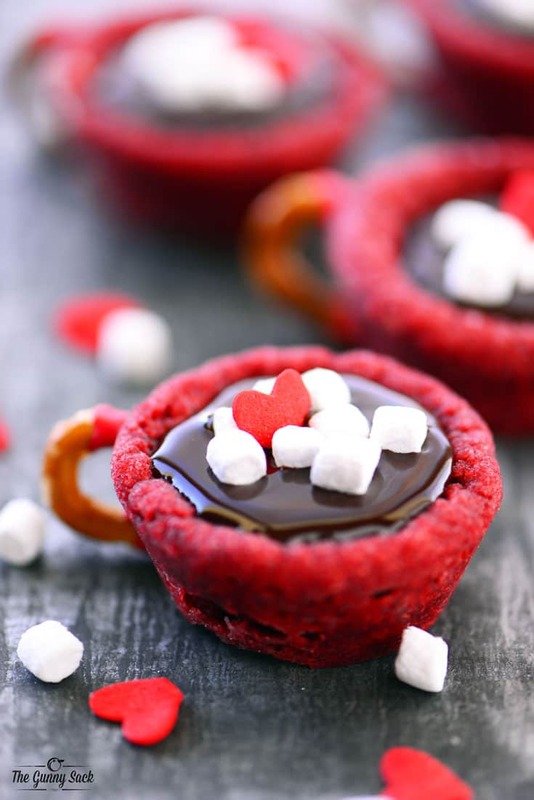 Or if you prefer, use pretzels for the handles like I did with the hot chocolate cookie cups. Allow the shaped to harden and then attach the handles with melted almond bark. 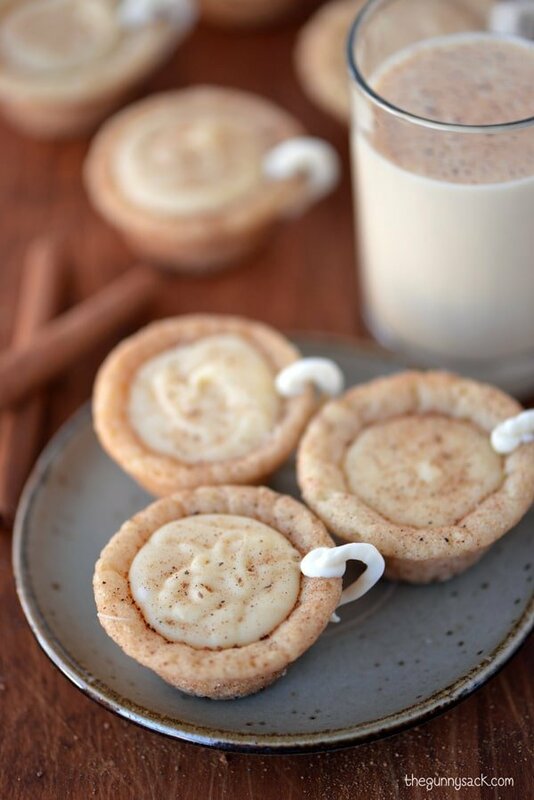 Enjoy these delicious eggnog cookie cups with a glass of cold eggnog…of course! 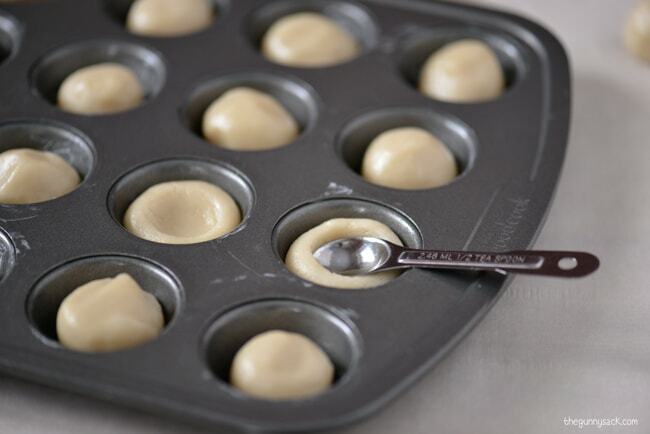 Start by greasing the mini muffin pan cups very well with shortening. 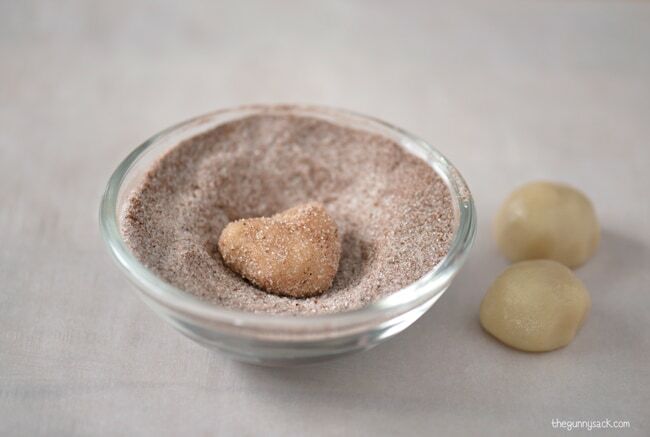 Mix together granulated sugar, cinnamon and nutmeg in a small bowl. Scoop one tablespoon of the dough, roll it into a ball and coat it with a mixture of sugar, cinnamon and nutmeg. Place the balls in the pan and use a small spoon (or your thumb) to make an indentation on each one. Allow the cookie cups to cool completely in the pan. Gently remove the cups. If you are having a hard time, use a knife to gently lift the edges. Bring the eggnog to a boil and pour it over the white chocolate chips. Allow it to sit for 3 minutes and then stir until the ganache is smooth and creamy. 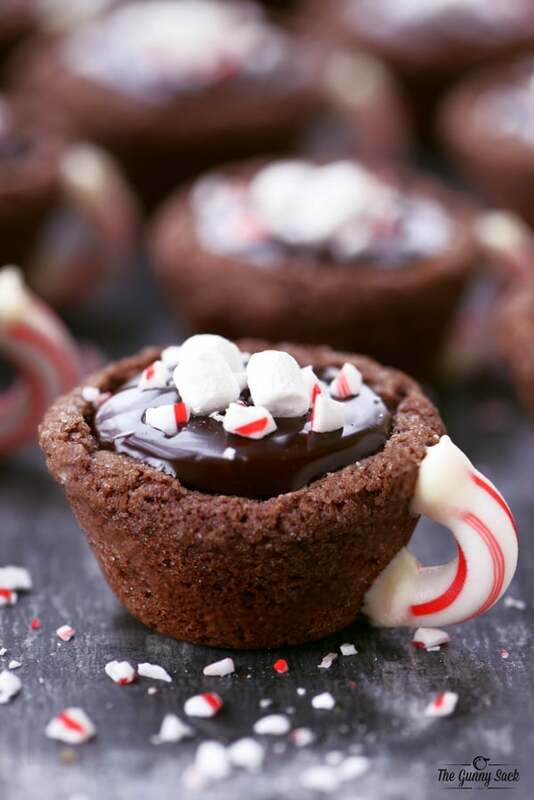 Fill the cookie cups with the eggnog ganache. Melt vanilla almond bark. 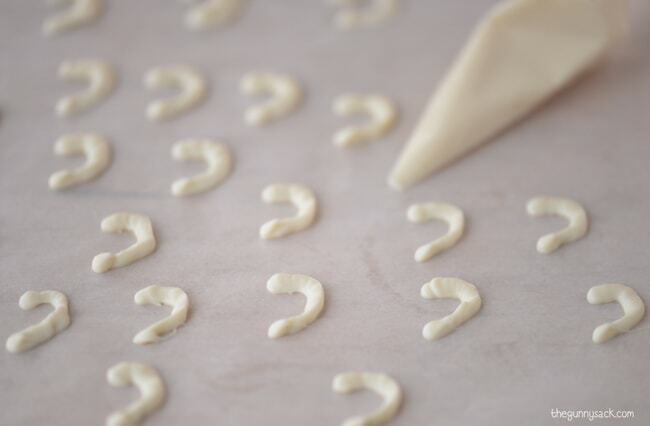 Pipe small, backward “c” shapes on parchment paper. Allow the shaped to harden and then attach the handles with melted almond bark. Legit speechless, these look unreal!! 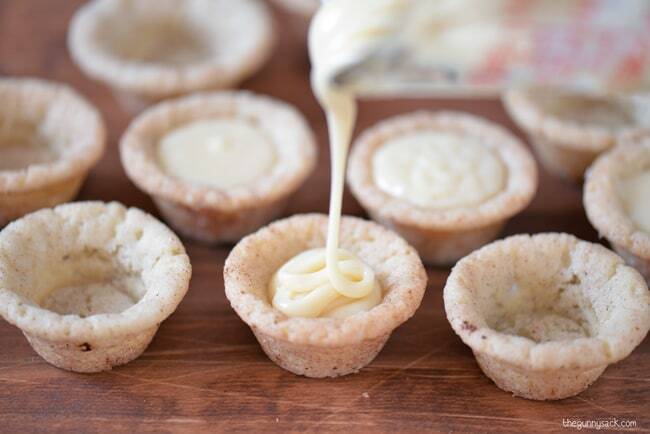 Oh my.. these eggnog cookie cups something new for me. I’ll definitely try this dessert! Thanks for sharing! I just love this presentation! Has anyone been successful at using their own sugar cookie dough as a base? Love it! you gave me the best idea for a tea party im planning! I love these!! And they’re super cute. And you made a video. And their eggnog!! Pinned! Seriously you are such a genius! I want this eggnog ganache like right now! These are totally adorable Tonia!! I confess, I’ve still never had eggnog! I know! But these are so dang adorable and the details are just amazing! Oh my gosh, these are the cutest things ever! I love them! !